Is Your Compensation Subject to More Tax? Your executive compensation could be subject to the 0.9% additional Medicare tax or the 3.8% net investment income tax (NIIT) when certain income exceeds the applicable threshold: $250,000 for married filing jointly, $125,000 for married filing separately, and $200,000 for other taxpayers. Concerned about how your executive compensation will be taxed? Please contact us in Brea (714.990.1040) or Visalia (559.732.4135). We can help you assess the potential tax impact and implement strategies to reduce it. With many valuable tax provisions having expired Dec. 31, 2014 — not to mention continued uncertainty about tax reform — tax planning is more complicated yet more important than ever. To save the most, you need to not only take advantage of every tax break you’re entitled but also be prepared to act quickly if tax legislation is signed into law. This is exactly what our Tax Planning Guide is designed to help you do. As you look through the guide, please note the strategies and tax law provisions that apply to your situation or that you would like to know more about. 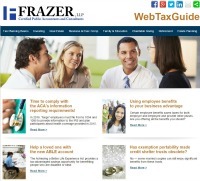 Then, call your Frazer LLP tax advisor with any questions you may have about these or other tax matters.